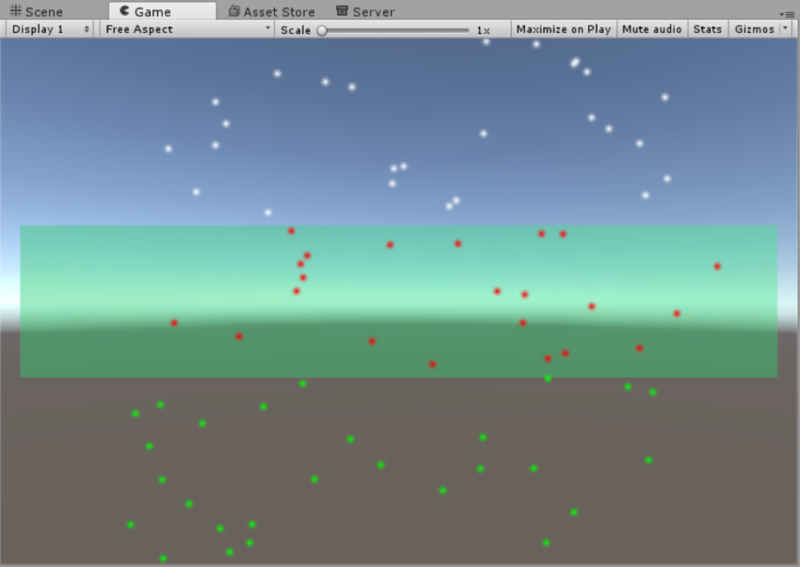 Particle systems have the ability to trigger a Callback whenever they interact with one or more Colliders in the Scene. The Callback can be triggered when a particle enters or exits a Collider, or during the time a particle is inside or outside of the Collider. 파티클이 콜라이더에 들어갈 때 파티클을 파괴하는 간단한 방법(예: 빗방울이 옥상에 닿지 않도록)으로 콜백을 사용하거나, 일부 또는 모든 파티클의 프로퍼티를 수정하기 위해 콜백을 사용할 수 있습니다. The Triggers module also offers the Kill option to remove particles automatically, and the Ignore option to ignore collision events, shown below. 이 모듈을 사용하려면 우선 트리거를 생성할 콜라이더를 추가한 다음, 사용할 이벤트를 선택해야 합니다. 다음 조건에 파티클이 해당할 경우 이벤트를 트리거하도록 설정할 수 있습니다. Inside Select Callback if you want the event to trigger when the particle is inside the Collider. Select Ignore for the event NOT to trigger when the particle is inside the Collider. Select Kill to destroy particles inside the Collider. Outside Select Callback if you want the event to trigger when the particle is outside the Collider. Select Ignore for the event NOT to trigger when the particle is outside the Collider. Select Kill to destroy particles outside the Collider. Enter Select Callback if you want the event to trigger when the particle enters the Collider. Select Ignore for the event NOT to trigger when the particle enters the Collider. Select Kill to destroy particles when they enter the Collider. Exit Select Callback if you want the event to trigger when the particle exits the Collider. Select Ignore for the event NOT to trigger when the particle exits the Collider. Select Kill to destroy particles when they exit the Collider. Radius Scale: This parameter sets the particle’s Collider bounds, allowing an event to appear to happen before or after the particle touches the Collider. For example, you may want a particle to appear to penetrate a Collider object’s surface a little before bouncing off, in which case you would set the Radius Scale to be a little less than 1. Note that this setting does not change when the event actually triggers, but can delay or advance the visual effect of the trigger. 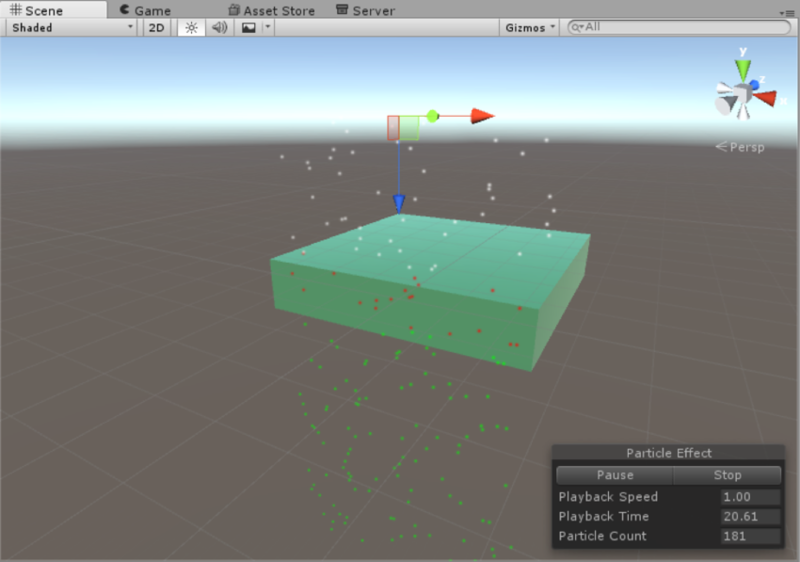 Visualize Bounds: This allows you to display the Particle’s Collider bounds in the Editor window. Inside the Callback, you can determine which particles meet which criteria by using ParticleSystem.GetTriggerParticles() along with the ParticleSystemTriggerEventType you want to specify. 아래의 예제에서 파티클은 콜라이더에 진입할 때 빨간색으로 변한 다음, 콜라이더의 범위를 벗어날 때 다시 녹색으로 변합니다. // the trigger conditions each frame.